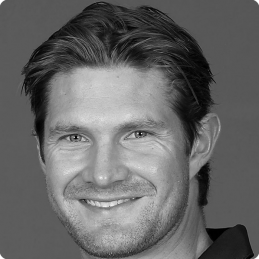 Shane Watson is one of Australia’s most influential cricketers and arguably the world’s number one all-rounder. As a respected and dedicated professional sportsman, Shane’s strong work ethic and values make him an invaluable ambassador and motivational public speaker. Shane’s International Cricket career spans more than a decade and draws on his experiences, both, on and off the field to motivate and inspire people of all demographics. In 2010 and 2011, he was awarded the illustrious Allan Border Medal as Australia’s best player after remodeling his bowling action to become a destructive and reliable competitor with both bat and ball in all forms of the game. Most recently, Shane scored an unbeaten 124 against India in a T20 International for Australia at the SCG to become the 10th man in history to score a century in all forms of International Cricket. Amongst Shane’s many career achievements, he was awarded Player of the Tournament in the ICC T20 World Cup in Sri Lanka in October 2012 after securing four consecutive Man of the Match awards. Appointed Vice Captain of the Australian Team between 2011-2013, Shane became Australia’s 44th Test Captain and was honoured to lead the Australian Team against India in Delhi in March 2013.